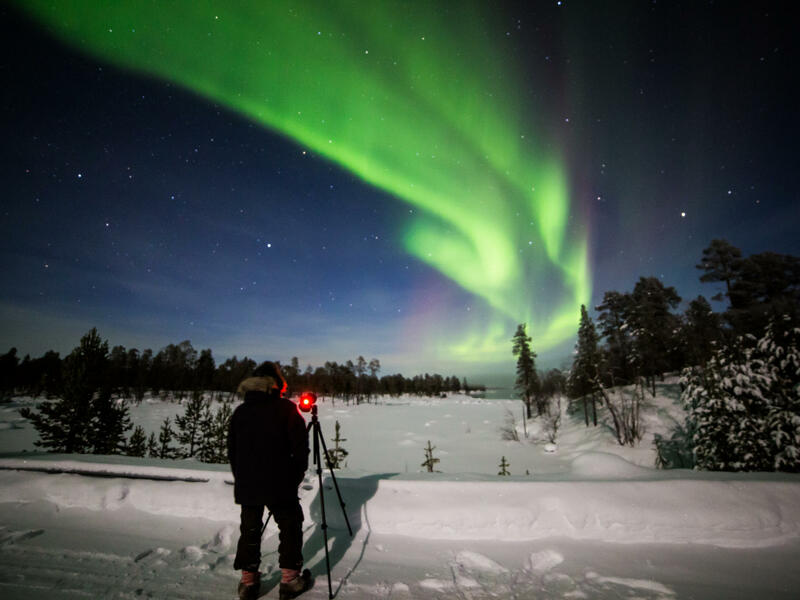 Spend three luxurious nights bathed by the Northern Lights, next to the deserted wilderness and the treeless fells, only a few minute walk from the village of Saariselkä. Let the wintery nature of Lapland enchant you while you experience unforgettable adventures and the dazzling beauty of the northern night sky! Guests are accommodated in Aurora Cabins. 29 square meter cabin has enough room for spending an evening together under the glass roof which provides a view of the star-filled sky and the Northern Lights. Breakfast, lunch, and dinners are provided in the Northern Lights Village’s cozy restaurant Kota with a picture window overlooking the reindeer paddock. During your stay, you have ample time to enjoy all of the most beautiful and impressive experiences and activities available in all of Lapland on our expertly organized expeditions. Warm clothes, a guide, and food are included in all activities so that you can fully relax. The Northern Lights Village specializes in hunting and photographing the Northern Lights. On all Aurora Expeditions you are guided by a professional photographer, who will help you take the best possible photos to share with your friends. – Free afternoon. Time for shopping or relaxation in the Saariselkä Spa, 500 meters from the Northern Lights Village. – Check out from the Aurora huts by 12:00 noon. If your flight is leaving later, we can store your luggage free of charge. – Transport to the Ivalo Airport. Time to say goodbye and welcome back!